AleaSoft, January 29, 2019. 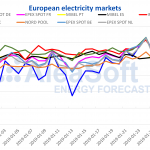 At AleaSoft, the proposal for the reform of the European electricity market to be approved by the European Parliament has been analysed, and its most relevant aspects for the wholesale electricity market are discussed below. 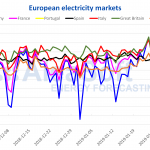 The agreement for the reform of the European electricity market reached on December 18 received on January 18 the approval of the Council of the European Union and the permanent representatives of the Parliament. The decision includes both the Directive and the Regulation for the internal electricity market, and must finally be approved in plenary session in the European Parliament by the end of March. The main goal of the reform is to adapt the electricity system to achieve the decarbonisation and renewable production goals of 2030. To this effect, the reform proposal aims to enhance the role of the consumer in the market, to facilitate the integration of renewables and to increase effective interconnection between national markets. At AleaSoft, this advance in the reform of the electricity market is seen as an important step in the right direction to create a more transparent, competitive and liberalized electricity market that provides reliable price signals to incentivize the necessary investments in renewable power and new technologies that bring us closer to the environmental goals of 2030 and 2050. Although in some of the points agreed upon the interests of some member states are visible, it is considered overall a positive proposal going in the right direction. On the wholesale electricity market, the proposal promotes a more active role for consumers by reducing the distance between the retail and wholesale markets, so that, thanks to new technologies and smart meters that must provide data in real time, the consumer can decide to manage their demand to make it more flexible and increase their efficiency by benefiting from lower prices during certain periods. For that purpose, the agreements establish that all consumers, domestic and industrial, must be able to have access to the market to be able to trade their demand and their self-produced energy, an indispensable step to adapt the market to the increase of photovoltaic installations for self-consumption, according to AleaSoft. On the demand side, the agreements already foresee that the figure of the aggregator will have an important role in the future of the market. The agreements urge the states to reduce the fixed share of the electricity bill, in order for the final consumer to correctly perceive the effectiveness of the measures to make demand more flexible. The proposal aims at a market that enhances the decentralized production of small renewable plants instead of centralized production in large plants. And for this, it wants to guarantee the priority dispatch for renewable plants of less than 400 kW. For an electricity system that advances towards decarbonisation and that can adequately integrate the increase in renewable production, the proposal emphasizes, on the one hand, the urgency of increasing interconnections between markets and that its capacity is available to wholesale markets. And, on the other hand, in the need to promote storage systems, such as batteries and hydrogen, both short-term and seasonal, that can meet the demand during times when renewable production is typically lower. Both measures are essential to be able to face the photovoltaic revolution, of which AleaSoft has already spoken in previous publications. At AleaSoft, proposals to make the market more transparent and that provide reliable price signals to investors are considered very interesting. The agreements consider it critical to remove price caps in the markets, so that the remuneration for peak plants can compensate their investment. Therefore, according to the proposal, capacity mechanisms will no longer be necessary to guarantee the necessary power for the security of supply. In any case, the proposed regulation leaves some room for the existence of capacity mechanisms as a last resort in the face of problems with the security of supply, but limits the emissions of the power stations under these mechanisms.